cute buckle accent made from folded grosgrain ribbon. 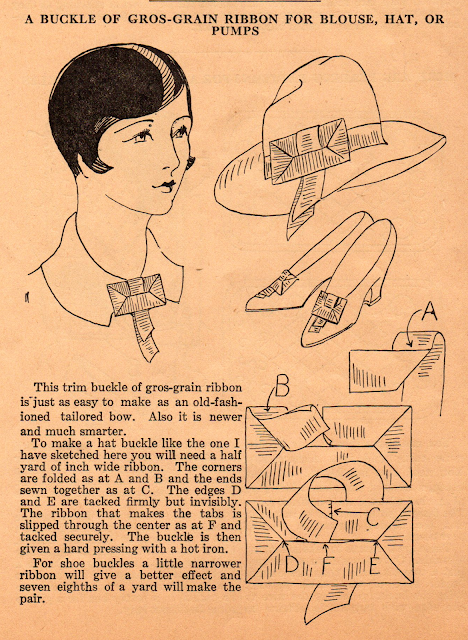 With her usual excellent illustrations, Ruth make these accessories very easy to make indeed! Hi Kathleen - I have an idea that keeps knocking around my brain but I need more info, and you may be my source! Is there a book with all of these wonderful 20's Ruth Wyeth Spears 'patterns' in it? I found one book from 1925 on Amazon but have yet to receive it. My question would be does someone still hold the patent on these patterns? I'm seriously considering putting a book together with several dozen of my favorite patterns and then my version of them, with instructions and pictures (like I've done on my blog) that people can use. What do you think? My partner ALONG WITH i necessary that you should thanks a lot for this superb verify!! OUR spouse AND when i unquestionably encountering pretty much every little this specific I've made it a person saved to be able to determine brand-new goods a person write-up. Thanks for such a great and useful article..Very nice and useful post.